Last Friday a friend told me she was going with the Rabbis for Human Rights, an Israeli organization, to a village called Sawya to help with the olive harvest. I invited myself along, eager to see Israelis and Palestinians interacting in such a positive way. Sawya is a hilltop village located between Ramallah and Nablus. When the Oslo Accord maps were being drawn up in 1993, nearly all of Sawya’s land was designated Area C, which means Israel has total security and administrative control of it. Virtually every new home built outside the circle of Sawya’s built-up area in 1993 is slated for demolition by the Israeli government. Meanwhile, illegal Israeli settlements all around it continue to expand, and the people of Sawya find it increasingly difficult to access their land. I caught a service taxi to the village on Friday morning and arrived just as two busloads of Israelis and Jewish Americans pulled up. Most of them were rabbinical students or members of an eco-kibbutz near Eilat. A tall, energetic rabbi in a t-shirt, baseball cap, and work jeans was the leader. He was an Israeli with an American accent and a full grey beard. He split everyone into two groups, and I joined the one heading to the olive harvest first. My group must have been the eco-kibbutzniks, because they were all dressed like Stanford hippies. (One of them, it turned out, actually was a Stanford hippy. Small world.) The odd man out was a guy in his thirties with a neatly-clipped beard and a green t-shirt. When we were introducing ourselves, he said, “My name is Daniel, and I’m sorry to say that last time I was here, I was wearing green.” He meant he had been a soldier in the Israeli army. Our Palestinian guide was an amiable man in his early forties named Abed, and he talked for a while about the work he did for women’s empowerment in Ramallah. He said women were slowly becoming more empowered in Palestinian society, and that a few mayors and several members of the Legislative Council were women. More and more women were also attending university. But they had a ways to go, especially in the more conservative towns and villages. He had met his wife at one of his empowerment workshops, he said, but unfortunately she had an East Jerusalem ID, which meant that if she moved to any part of the West Bank behind the Wall, she would lose her ID along with many freedoms and privileges. As for Abed, he was strictly forbidden from living in East Jerusalem, and even to visit he had to get a permit. He has a daughter but rarely sees her. He talked also about Sawya, its land, and the settlements. Pretty basic stuff, but it all seemed to be news to the kibbutzniks. The questions they asked made it clear they didn’t have even a basic grasp of the situation. It was good that they were there, but it had taken me a year before I felt I had a decent handle on the situation (condensed neatly for you in my book). I desperately wished I could do a Vulcan mind meld with these kids. Or give them each a copy of my book. They were also missing out on the essence of the harvest. It was pleasant enough, but two hours with a bunch of internationals could hardly be called a real olive harvest experience. We found the other group soon, and now it was their turn to harvest olives for two hours and our turn to go on a small tour of West Bank oppression. Our first stop was the Huwara Checkpoint south of Nablus, where the rabbi got out and told us a few basics about checkpoints and roadblocks and settlement policies. Even when the Palestinians were given permission to access one of these ‘hot spots,’ the permissions were often revoked without warning or decreased from three days to one and a half without reason. The presence of Israelis and internationals was often the only thing that could convince soldiers either to protect Palestinians from settlers or to allow them as much access to their land as they were legally entitled to under Israel’s military authority (inadequate as it usually was). Just as the Rabbis for Human Rights were congratulating themselves for their good work, he said, they began to realize that what they were doing was even more inadequate than they feared. They were only helping a relatively small percentage of Palestinians access their land, and only during the olive harvest itself. If farmers didn’t have access to the land for the rest of the year — to prune the trees, plow the land, and do other maintenance work — the olive yield was much smaller. The rabbis tried to incorporate this reality into their activism as well, but it was impossible to keep up with all the damage control that was needed. He also talked about cases where settlers had stolen families’ entire days’ olive harvests at gunpoint, not because they wanted the olives but to deprive Palestinians of their livelihood. Much worse, sometimes they cut down or burned hundreds of trees at a time. Olive trees, with their ancient years and deep roots, were powerful symbols of Palestinian ties to the land. Settlers apparently hoped that by destroying these trees, they were solidifying their own claims to the land. In Burin, a lovely village where I once enjoyed a huge dinner with a family who invited me in while I was on my way to Nablus, forty trees were just cut down by settlers in response to Israeli police evacuating three illegal structures in various West Bank outposts. In Al Mughayir, a Palestinian village northeast of Ramallah, which like Sawya is surrounded by Area C land, two hundred trees were cut down by settlers from an ‘outpost,’ a small ideological settlement satellite built in contravention even of Israeli law. I’ve heard families have heated arguments over the fate of a single tree. Each tree is like a member of the family, raised and cared for and climbed and combed over many lifetimes, an endlessly renewable source of dignified income and indispensable olives and oil. It is nearly impossible for Westerners to grasp what these trees mean to their owners. Losing 40 at once, or 70, or 650 in the case of one Jayyous farmer in 2005, is felt as a kind of massacre. The rabbi mentioned that in recent years, the Israeli army has gotten better about protecting Palestinians from settlers and allowing them access to more land so they could harvest their olives with less harassment. This apparently isn’t saying very much. It was impossible for me to keep my mouth shut when the rabbi spoke as if settler vigilantism were some kind of inevitable force that Israel was totally helpless against. The rabbi winced and looked away. He knew as well as I did that it was a rhetorical question. “Unfortunately, there’s a double standard when it comes to enforcing laws here,” he said. Just then an Israeli soldier approached our group. The rabbi asked him what the problem was. The conversation was in Hebrew, but the gist of it was that he didn’t have a permit to stand near a checkpoint and give a talk. We got back on our bus and headed back to Sawya. Alas, people with religious (pre)texts and guns—that’s the problem. Perhaps the rabbi was right. Either way, doing these good works is indispensable while the occupation is still in full force, stealing land, using children as human shields, and assaulting Palestinian farmers. But as long as the occupation goes on, these injustices will be happening in thousands of places where a rabbi doesn’t happen to be watching. As long as the occupation goes on, they’re only dealing with a few symptoms, not the disease. The overwhelming majority of Palestinians already choose non-violence (and often get arrested, beaten, or shot for their trouble). But the trigger for violent resistance will always be there until the occupation is ended, with liberty and justice for all. Soon the volunteers left and I was the last person remaining. It was only two o’clock. I asked Abed if I could have a quick tour of the village before I headed back to Ramallah. He said sure, and we caught a ride up the hill to the village’s main street and went on a walk around town. It was a typical Palestinian hilltop village with old stone houses (and newer cinderblock additions), narrow winding roads, and spectacular views everywhere. Across the valley to the east we could see half a dozen picturesque hilltops, nearly all with settlements or settler outposts on top of them. The main settlement was called Eli. I didn’t have any plans in Ramallah the next day, and it had been a while since I harvested in a new village, so I accepted the invitation. We stopped to have tea and grapes on another relative’s porch on the highest point in Sawya to watch the sunset. The shadows of the blushing hills got longer and longer, and the villages and settlements all around began to glow as they turned their lights on for the night. We walked back to his porch under a crescent moon and sat with his brother Ibrahim, a tall man with a thin face and friendly English. His wife was a lovely woman with a shy smile and eyes that looked like my grandmother’s when she was a young woman. She looked to be in her mid-thirties, but when her hijab slipped slightly, I saw streaks of premature white in her hair. Ibrahim’s adorable sons, aged 2, 6, and 8, ran around the whole time playing and laughing. The youngest, Yazid, looked exactly like his mother. “I’m so sorry,” I said, aghast. “I have three nephews, and if anyone hurt them…” I couldn’t finish the sentence. I paused for a moment, speechless. “Was the settler punished?” I asked, with a sinking feeling that I already knew the answer. “That’s it?” My outrage was unnaturally muted because I had heard so many stories like this before — a necessary kind of psychological scar tissue to keep the ulcers away. But even if the physiological manifestations of anger are attenuated, something deeper is injured whenever I hear a story like that. “He only served six months in the end,” Abed said with the same hollow numbness. Talk gradually turned back to pleasanter things, because one can’t dwell on the worst of life all the time. The dark abyss is only touched on now and then and otherwise ignored in public and grieved in private. You can manage to forget it for hours at a time. But it’s always there. The good is always there, too. The sun and the fields and children who are still alive. We had fareeka (wheat soup) with baked chicken for dinner that night at Ibrahim’s house and watched movies in English on MBC2. Ibrahim had a relatively nice house because he had managed to get a permit to work in Tel Aviv. He spoke fluent Hebrew. Like Abed, he didn’t demonize Israelis. He just wished they would protect everyone equally under the law. The next morning we got up early and headed to the groves. It was a delightful day. Ibrahim’s three adorable sons were there as well as Abed’s sister’s son and daughter. The son was a blue-eyed, cheerful pre-teen, the daughter a dark-eyed and clever young woman who followed me around and chatted with me all day. Abed told me proudly that they were both first in their class at school. Their father had died a few years earlier, and their mother was a teacher. “United States!” his blue-eyed cousin said. “China!” the dark-eyed niece said. “Um… Um… Europe!” That was the six-year-old. “Russia!” they all said in delighted unison. I took some pictures of them, and they insisted on taking some pictures of me. Goofing around while the women work! Everyone burst out laughing. (Teez is a bad word in Arabic. It’s an impolite way to say ‘buttocks.’) He didn’t understand why everyone was laughing. He was just happy to be the center of attention. In a little over twenty-four hours, a new village had been colored in on my map with faces and friends, views and porches, children and stories. When it was time for me to leave, they made me promise to come back as soon as I could. As I was walking toward the road to find a service taxi, the children gathered to smile and wave good-bye to me, an American, with boundless innocent, friendly good will. It struck me as something so fragile and unlikely in such a dire and unfair situation, I instinctively grabbed for my camera to try to capture it and remember the feeling it gave me, the feeling Palestine so often gives me that meanness and ugliness aren’t the natural state of man after all. But it was something too pure to capture in any way. Of course. Anyone who is threatened has a right to defend himself. I never said Israel didn’t have a right to defend itself. I only said the route of the Wall through occupied territory that isolates private property from its owners was illegal. If Israel wants to build a Wall on its own land, it is more than welcome. But there I spent two entire paragraphs on the defensive, explaining an obvious point. This is why these talking points are so effective. Whether wittingly or not, they support the status quo because they keep us away from debate about the real issues. One of my favorite pro-occupation talking points is the line, “Where is the Palestinian Gandhi?” There are several subtexts to this line. One is that the Palestinians apparently deserve whatever Israel dishes out to them until they produce a super-human peace activist like Gandhi or Martin Luther King. As if the British had every right to stay in India forever if Gandhi hadn’t appeared. As if segregation was OK right up until MLK found his platform. Another subtext is that Palestinian culture isn’t capable of producing peace activists — that Palestinians are inherently more unreasonable and therefore culturally inferior to Israelis. Israel has plenty of peace activists, soldiers who refuse to serve in the Israeli army, and human rights organizations. All of them are vilified by the right-wing in Israel and ignored by the mainstream, but at least they exist and call for Palestinian human rights. Where’s the Palestinian brave enough to champion Israeli rights? To understand why this line is nonsensical, first you have to understand that in the minds of Palestinians, this is not a conflict between equals, with equal moral claims, any more than the Apartheid struggle or the anti-segregation struggle were conflicts between equals with equal moral claims. Imagine an outraged Senator from Mississippi in 1962 saying, “We have plenty of white people working against segregation. Where’s the black man brave enough to speak up for Southern white rights?” It’s an absurdity. The vast majority of Palestinians aren’t trying to take anyone else’s rights away (unless you consider it an Israeli ‘right’ to build illegal homes on Palestinian private property or collectively punish Palestinians in violation of international law). They’re struggling to have their most basic human rights respected. Second, you have to look at reality. Palestinians engage in non-violent struggle against the occupation on a daily basis. From the weekly demonstrations against the Wall that steals land from villages like Bil’in, Na’lin, and Jayyous to the tireless work of Palestinians traveling all over the world to educate communities about the realities in Palestine, I’ve never seen a more politically-active population in my life. They have human rights organizations and NGOs covering every issue from prisoners to health care to water rights. They invite Israelis to march along side them in olive harvests, community works, and demonstrations. They write. They blog. They simply try to keep living under this insane situation while retaining their dignity, hospitality, and sense of humor. Nearly everyone I bring to the West Bank and show them the situation, before they leave they end up saying in hushed tones, “You know, the only thing I’m really surprised about, given the unbelievable things they have to put up with, is that there’s not more Palestinian violence.” You truly have to see this situation to fully understand how bad it is. And how are non-violent Palestinian activists treated by Israel? Are they held up as examples for Israelis and Palestinians both to follow? Covered extensively in the Israeli media as great hopes for peace and interviewed about their points of view? Invited to speak at Israeli universities? Not so much. This Israeli press, like the American one, almost without fail, ignores them completely. The non-violent demonstrations at the Wall are met with tear gas fired by Israeli soldiers at least, lethal force at most. Half a dozen unarmed people have been killed and dozens injured (some paralyzed or left with brain damage) by Israeli soldiers at these protests. Dozens more have been arrested — pulled out of their homes in dead-of-night arrest raids by Israeli soldiers — and held without charge, or under absurd charges. In one case, the Israeli army produced a photograph that ‘proved’ a certain leader of non-violent activities had been throwing stones at soldiers on such-and-such a date. His lawyers produced his passport. He had been out of the country on that date. Yet if it hadn’t been for this crucial (and lucky) piece of evidence, he might still be in jail today. My friend Mohammad Othman from Jayyous, a tireless non-violent activist for the past ten years, is in Israeli jail right now, held in solitary confinement in miserable conditions with no charges whatsoever brought against him. He was seized about a month ago at the border crossing between Jordan and the West Bank (Israel controls this crossing) when he was returning home from an educational tour in Norway. Martin Luther King Jr. reminded us that “change does not roll in on the wheels of inevitability, but comes through continuous struggle. And so we must straighten our backs and work for our freedom.” President Obama, you promised us change and we believed in that promise. Now is your opportunity to show us you meant it. We have frequently heard the question over the years, “Where is the Palestinian Gandhi? Where are those working for justice through non-violence?” We must look no further than the jails and cemeteries to find Palestinian peace activists leading the fight against injustice. This is where we will find Mohammad Othman: locked in solitary confinement in a military prison, and held for nearly a month after his arrest without charge or trial. His initial detention has been extended three times thus far, and there remains the possibility of it being renewed indefinitely. On September 22nd, 33-year-old Mohammad was arrested by Israeli soldiers while trying to reenter the West Bank after spending several days at a conference in Norway. For more than 10 years Mohammad has been an activist for Palestinian human rights. During that time, he has been a leader in the Palestinian grassroots movement against the Wall that has swallowed up his community’s lands and livelihoods. Mohammad, in the spirit of great human rights defenders like Mahatma Gandhi and Martin Luther King Jr., has worked tirelessly over the years to bring his people’s voice to the world. He has embraced and advocated non violent means to effect change – a tactic that was instrumental in bringing about the end of apartheid in South Africa. Freedom from occupation, oppression and discrimination are human rights to which all people are entitled. Mohammad, and many others like him, have done nothing more than work to secure these most basic guarantees – to give his people a chance to live. Unfortunately, what is happening to Mohammad is all too common. Palestinians working for justice are constantly threatened with arbitrary detention, bodily injury and torture, and even death. Imagine having to fear speaking the truth, knowing that by doing so you put your very freedom at stake, simply because you stand up for what is right and what is just. History has shown us that peaceful activists are often the target of such policies, if only because they pose the most severe threat to the status quo. It happened in South Africa, it happened in India, and it happened in the United States as well. Mohammad is another casualty of this tactic. It is up to us, the international community, to defend him and all those who struggle for peace and justice. President Obama, if you are serious about forging peace, then we call on you to defend the right of Mohammad and all Palestinians to resist their oppression through non-violent activism. We implore you to pressure Israel for the immediate release of human rights advocate Mohammad Othman and all prisoners of conscience who are being held solely for their work towards justice and freedom. You can sign on to the letter here. Here are a few maps that will make my book (and the conflict in general) much more intelligible. Above is a close-up of the West Bank. Down the central spine of the West Bank are the Palestinian cities of Jenin, Nablus, Ramallah, Jerusalem, Bethlehem, and Hebron. To the northwest are Tulkarem and Qalqilia, and in the desert north of the Dead Sea, there’s Jericho, where it’s always summer. For a high-definition .pdf version of this map, click here. This map is a little tricky, but let me explain, because it’s very important. Under the Oslo Accords of 1993, the Palestinian territories were divided into three areas: Area A (17%) falls under the nominal security and civil control of the Palestinian Authority (PA), although the Israeli army reserves the right to enter at will. Area B (24%) falls under Israeli security control, with the PA responsible for some civil affairs. Area C (59%) falls under total Israeli civil and military control. 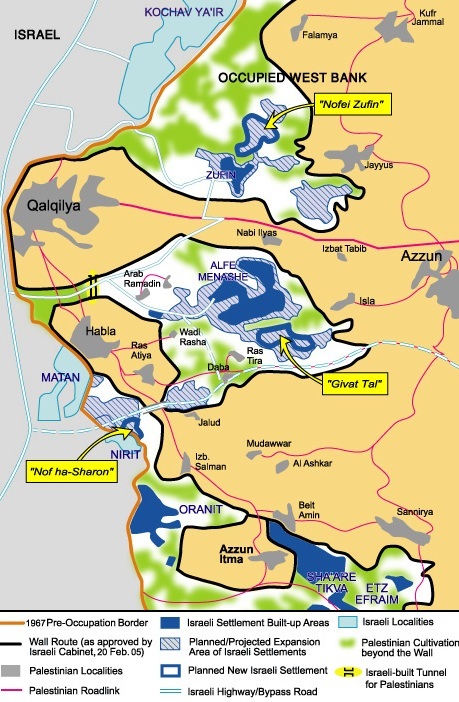 Area C contains virtually all Israeli settlements and settler roads, large buffer zones around them, most of the Jordan River valley, and all of the Dead Sea coast. Areas A and B are divided into many ‘islands’ separated from one another by Israeli-controlled Area C. According to the Oslo Accords of 1993, Area C was supposed to transition to Palestinian control within five years. Instead, the Israeli government continues to fill Area C with settlements and to restrict Palestinian access to it. So this is a detailed map of the settlements and of Areas A, B, and C. Dark red patches are Palestinian cities and villages, orange and tan patches are Areas A and B, and the rest of the territory is Area C. Dark blue patches are Israeli settlements while teal and pale blue areas are settlement municipal boundaries and jurisdictional areas. (Hebron, with its green and brown areas, is its own special case and will be discussed in a forthcoming blog post.) Source: B’Tselem (The Israeli Information Center for Human Rights in the Occupied Territories). The settlements are usually built on hilltops (so they can keep an eye on everything in their area) near fertile land, aquifers, and/or sites that are holy to all three major monotheistic religions. Control of water is particularly important, as the groundwater is being taken out of the Holy Land faster than it’s being replaced. Israel has control over virtually all of it — some of the largest settlements built deepest into the West Bank are built over major aquifers — and they often take water out of the West Bank and sell it back to the Palestinians at low volumes and inflated prices. Palestinians find it nearly impossible to get a permit from the Israelis to build much-needed wells on their own land. Thus it is a common sight to see Palestinians rationing drinking water in the summer while settlers top off their swimming pools and water their lawns. The settlement enterprise is, among other things, an attempt to make Israeli control over West Bank water permanent. Amnesty International recently published a report about Israel’s denial of basic water rights to Palestinians. Read the BBC’s summary of it here. This is a picture of the Wall Israel is building. The black lines are sections of the Wall already finished as of February 2007 while the red lines are sections that are approved and/or under construction. Whenever the Wall’s route deviates from the Green Line (the border between the West Bank and Israel), it is being built on occupied Palestinian land and is illegal according to international law. Its illegality was confirmed by the International Court of Justice in 2004. All the blue dots and splotches are settlements, and the white areas are settlement areas behind the Wall that are totally controlled by Israel. Much of it Palestinian private property that was illegally expropriated for the settlements or for Israeli-only roads. This map does not include the more than 500 internal checkpoints and roadblocks that further break up and isolate each part of the West Bank from the other — sometimes going so far as to make it impossible or illegal for people to leave their villages by car at all, forcing them to walk to a main road and try to find a taxi — but this gives you a small idea of what Palestinians go through. Here’s a close-up of the Wall in the Qalqilia and Jayyous area. Jayyous is the village — the grey blotch — just under the yellow box that says “Nofei Zufin.” I have spent many happy days there. As you can perhaps make out, the Wall in this area isolates or destroys most of Jayyous’ land. All of Jayyous’ seven water wells are isolated by the Wall. A settlement called Zufin has already been built illegally on Jayyous’ land, and another settlement called Nofei Zufin is in the process of being built. Farmers find it increasingly impossible to get permission from Israel to work their land that falls on the other side of the Wall while settlements (the blue blotches and their light blue areas of planned expansion) continue to expand all over the West Bank. As you can see, the entire city of Qalqilia is surrounded by the Wall, which in this area is a 25-foot-tall concrete structure punctuated by sniper towers. This was before the world refused to recognize the results of the democratic Palestinian elections of January 2006, with disastrous results. But the important point is, even the Israeli security services know in their hearts that there is no military solution to this conflict. You can’t ghettoize, arrest, shoot, and bomb Palestinians into submission forever. Any reasonable solution to this conflict has to be political, negotiated in good faith, and based on international law. Aside from this, if anyone looks at these maps and doesn’t believe that at least one purpose of the Wall is to grab as much Palestinian land with as few Palestinians on it as possible, please leave a comment and explain. I would be very interested to hear your reasoning. Above is a map of the Wall in East Jerusalem. This picture represents more pain and heartache than I can summarize in a paragraph, but I’ll explain as well as I can. The grey area is Israel (including Israeli West Jerusalem) while the white area is the occupied West Bank. The tan areas are Palestinian cities and villages (Ramallah in the north, Palestinian East Jerusalem in the middle, Bethlehem in the south). The purple areas are Israeli settlements, all built illegally on Palestinian land. Many of these are being expanded and new ones are being built. The red line is the planned route of the Wall. Notice how the Wall weaves around to isolate as many Palestinian areas as possible from East Jerusalem while seizing as many settlements and as much land as possible. Bethlehem has been particularly devastated. Not only does the Wall surround Bethlehem and isolate most its land, turning it into a ghetto, the Wall and settlements also break the ancient link with its sister holy city Jerusalem. Notice also how many Palestinian communities are separated or cut off from each other — Shu’fat and Shu’fat Refugee Camp, Beit Hanina and Beit Hanina al Balad, East Jerusalem and Abu Dis, and on and on. Above is the checkpoint near Qalandia village between Ramallah and Jerusalem. Most of my Palestinian friends in Ramallah can’t get permits from the Israeli army to cross this checkpoint and visit Jerusalem, even if they were born there or went to high school there. Foreigners can breeze straight through. I never get used to this. Below are three pictures of the Wall in East Jerusalem. 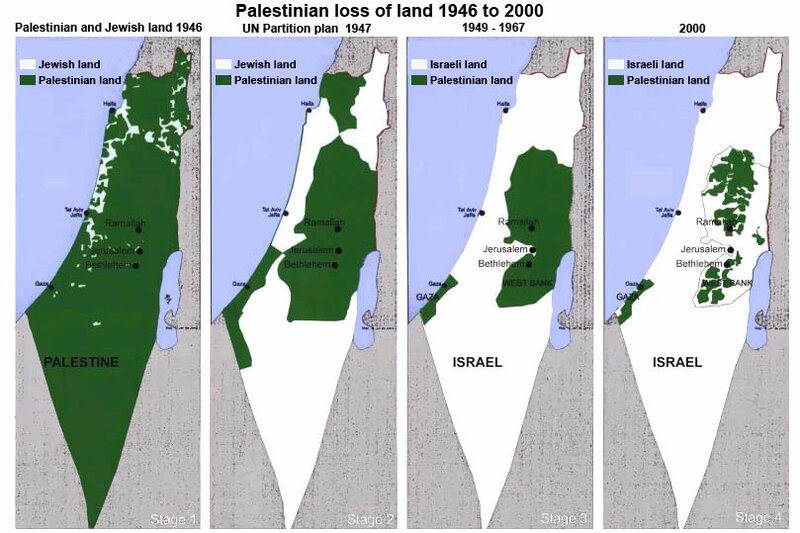 The map below shows the evolution of sovereignty over historic Palestine from 1946 to the present. The first panel shows approximately how much land was owned by Jewish residents in 1946. The second shows the UN partition plan, which proposed giving 55% of the land to Jewish sovereignty even though Jews owned about 7% of the land. The Arab world rejected this, but they were overpowered by well-armed and organized Zionist militias funded and aided by Europe. In 1948, the state of Israel was declared on the white area in the third panel. In 1967, Israel also conquered the West Bank and Gaza, and the fourth panel shows Areas A and B as staked out under the Oslo Accords — the less than half of the West Bank and Gaza that falls under even limited Palestinian control. Many Israeli leaders in high government office claim much of Area C as Israeli territory and would prefer to force the Palestinians to live in cantons or ghettos largely confined to Areas A and B without meaningful sovereignty, and label this a “two-state solution.” The Palestinians will never allow it to happen, and neither should people of conscience anywhere in the world. If you’re wondering what any of this has to do with you as an American (if you’re an American), Israel is the largest recipient of US foreign aid in the world. We give them over $3 billion a year — that’s $10 million every single day — of our tax dollars. This is what they do with it. The US government has also vetoed dozens of UN resolutions condemning Israel’s violations of international law. Americans more than anyone else have the power to put pressure on Israel to change its policies. Unfortunately, the Israel lobby is one of the most powerful in Washington while Palestinians have virtually no presence on Capitol Hill. Very few Senators and Representatives are willing to pay the political price of crossing the Israel lobby based on principle alone. Therefore it’s up to us to learn more about this situation and put pressure on our representatives to end America’s support of Israel’s illegal policies. 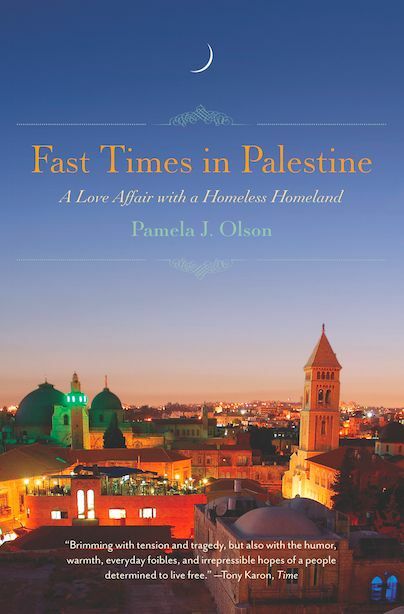 For a more thorough historical and political context as well as many colorful, suspenseful, funny, tragic, and even a few romantic stories about life behind the Wall, check out my book Fast Times in Palestine, published in March 2013. You can view the book’s Amazon page here. My book ends in 2007, but it’s a pity, because the fast times keep on coming. On Saturday, October 3, I went to Taybeh’s annual Oktoberfest. Taybeh is a Christian village northeast of Ramallah, home of the Taybeh Brewery that produces Palestine’s beer, also called Taybeh. Legend has it that Salah al Din (Saladin), the Kurdish general who drove the Crusaders out of Palestine, visited Taybeh (Biblical Ephraim) and declared its people to be “Taybeen” (kind folks) due to their generosity and hospitality. 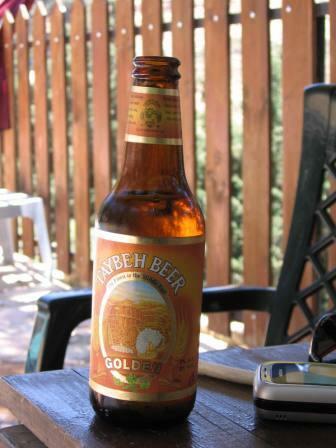 The word Taybeh also means ‘delicious,’ which fits their golden, preservative-free beer perfectly. Taybeh, like most Palestinian villages, is made up of white stone houses, schools, businesses, and places of worship (churches rather than mosques in this case) built on top of a hill with stunning views of terraced hills and Biblical valleys all around. The picturesque ruins of a Byzantine church, capped by an ornate white stone cross, mark the center of the town, and nearby are the City Hall grounds, where a stage had been set up. Inside City Hall itself, local arts and crafts, colorful embroidery and olive oil soap, food and wine, honey and beer were being sold. I arrived too late to see a Japanese group give a martial arts demonstration on the main stage. The connection is that Taybeh has licensed its family recipe to producers in Japan and Belgium (though Belgium didn’t offer any martial arts demonstrations). I went to the brewery first. I’d been drinking Taybeh beer for so many years, I was excited to take a pilgrimage to the source. I’m not sure what I expected exactly. Perhaps some picturesque cottage with golden skies and waterfalls of beer pouring carelessly from giant wooden casks. This is what’s on the label, anyway. Or at least a huge gift shop. It’s the global center of Taybeh beer! 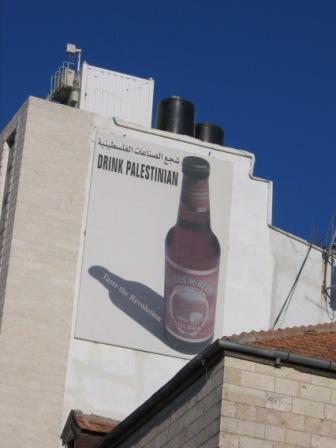 They even have this gratuitous but awesome slogan: “Drink Palestinian. Taste the Revolution.” Who wouldn’t want a T-shirt with this and their logo on it, especially knowing it came from mild-mannered Christian beer makers? The brewery was located on a beautiful hilltop, a rather small factory with giant metal casks mixing and brewing and a small industrial-grade bottling machine. Even the sign that indicated you had reached the factory was rather amateurishly hand-painted on the wall. No wooden casks. But I guess the taste of the beer speaks for itself. We were given a quick tour of the facilities and then invited to the gift shop, where we could buy beer, wine, olive oil, T-shirts, mugs, bumper stickers, and post cards. To my disappointment, they didn’t have any “Taste the Revolution” T-shirts. If anyone in Taybeh is reading this, I think they’d sell like hotcakes. You’ve got a great slogan. Milk it. I went back to City Hall, which was crowded with Palestinians and foreigners from all over the Holy Land. I was particularly impressed by the number of Palestinian-Israelis (usually called ‘Arab-Israelis’ to downplay their Palestinian identity) who showed up from Jerusalem, Nazareth, Akka, and elsewhere. They’ve started coming to Nablus to shop on Saturdays, and they’re always in Ramallah on the weekends taking over our bars and dance clubs since we’re so damn hip. Whatever your political convictions, on the ground this place is turning more and more into one state. Since it was explicitly a festival celebrating alcohol, it drew a self-selected crowd. There were a few women in hijab there to see the traditional singing and dancing, people-watch, and shop. But for the most part it was a super-concentrated subset of the most liberal and laid-back Palestinians, and the atmosphere was beautifully calm and happy. Eye candy stretched as far as the eye could see, with everyone dressed to see and be seen. It felt like the old days, when I used to walk around Ramallah and know just about everyone. It was such a friendly party atmosphere and such a good feeling. After stocking up on Christmas presents and touring the Byzantine ruins, I ran into an old friend from Jayyous and his buddies, and we walked up to the stage, front and center, and danced for five hours to Palestinian hip hop, traditional Palestinian music (with drum riffs that practically shake your shoulders for you), German jazz/ska, and a Palestinian rock-rap band from Jerusalem called CultureSHOC whose sound was so unique, I don’t think the ‘rock-rap’ label does it justice (and whose lead singers were such a good-looking couple, it just didn’t seem fair). Later I was at Zan bar in Ramallah with some friends, and the lead singers walked in and sat at the table next to us. I wanted to say hi but couldn’t figure out how to pull it off without seeming fan-ish. One the one hand, you don’t stand up on a stage if you don’t want to be known. On the other hand, sometimes you just want to enjoy your beers in peace. Still, it’s another of the things I love so much about Palestine. It’s such a beautifully local scene, yet it has a strong international component. It’s a microcosm of intensely interesting life with global implications. You feel like you’re in a small town at the center of the world. There’s no place quite like it. As for my book, I’m about to finish drafting Chapters 9-12, after which I’ll be in editing mode for the rest of 2009—my favorite thing. I can edit happily for hours without coming up for air. It’s just collecting notes, outlining, and drafting that’s like pulling teeth. But guess what? My grandfather beat me to the punch! At age 82, he finished his first book, Stories from the Pen of Melvin Reavis, and my mother published it on Blurb.com. It’s a lot of hilarious stories and great pictures from his youth as a farmer’s son in eastern Oklahoma during the Depression. They didn’t have a car or electricity, but they had plenty of cows and creeks and cousins, and as I recall, that’s all it takes to make a childhood awesome. Check out the first few stories here. There’s bad news, though, in Palestine. The Goldstone Report recently came out, a UN investigation by former South African judge Richard Goldstone (who happens to be Jewish), which detailed war crimes and crimes against humanity in Gaza earlier this year. The Israeli army killed about 1,400 Gazans, most of them civilians, hundreds of them children, while Palestinians killed three Israeli civilians and six soldiers. (Four more Israeli soldiers were killed by ‘friendly fire.’) Due to the gross discrepancy between the death counts, the report focuses more on Israel’s crimes than on Hamas’, which the Israelis claim indicates a bias against Israel. Really? How about next time, you kill only nine people, one-third of them civilians, instead of 1,400, two-thirds of them civilians. Then we’ll talk about equal coverage of crimes. And by the way, do you really want to hold yourself to no higher standard than Hamas? Alleged crimes committed by the Israeli army include shooting people who were waving white flags, destroying factories, restaurants, museums, schools, UN buildings, power plants, and neighborhoods, denying medical treatment to dying women and children, and shooting deadly white phosphorus into civilian areas. The meta-crime is the idea of collectively punishing entire civilian populations, first with the blockade and mass imprisonments, then with shooting and blowing up people and their homes, schools, and businesses in shocking excess in order to ‘deter’ rocket fire. The numbers are slightly different, but the overall thrust of what was done to Gaza is the same. You might ask, “But doesn’t Israel have a right to defend itself?” My answer is and has always been, “Of course.” But this is a red herring. The questions is not whether Israel has a right to defend itself — no one seriously disputes this. But imagine if your country drove thousands of people from their homes and concentrated them into a ghetto, and then imposed a hermetic seal on this ghetto so that even basic goods couldn’t get in or out. Imagine if a minority of these people decided to fight back using nefarious means such as targeting your civilians with home-made weapons that have a 0.5% kill rate (i.e., one in 200 finds its target). Would you be justified in storming into this ghetto and killing 100 random people, mostly civilians, for each of your people — civilian or soldier — killed in order to ‘deter’ the ghettoized people from fighting back? What about destroying their factories and further making a dignified life impossible for them? Does Israel really think such outrageous collective punishments will bring peace and security? Imagine what Gaza kids grow up seeing and thinking. Imagine watching your mother suffer and die because she can’t get basic medicine or because she was shot while waving a white flag. Given their situation (which is nearly impossible to understand fully if you don’t see it for yourself, though my book tries its best to explain, starting from the beginning), the miracle is that so few turn to violence. The only way the Holy Land can ever have peace is if all people are allowed their basic rights to life and liberty. Or you can read this article, where an Israeli soldier says his overriding impression of Gaza operations was ‘chaos’ and the ‘indiscriminate use of force.’ “Gaza was considered a playground for sharpshooters,” he explained. This article was written in 2005. Indiscriminate force is nothing new in Gaza. It was just the scale of the slaughter in 2009 that caught the world’s attention. After ten years of being treated like fish in a barrel, Goldstone finally gave Gazans a voice. This is what’s being done to us. The world ought to know. The UN Human Rights Council was going to vote to pass the Goldstone Report to the UN General Assembly for further action, potentially leading to sanctions or prosecution for war crimes at the International Criminal Court if Israel refused to undertake a credible investigation of their own actions. (So far Israel has refused this step. They did a perfunctory ‘investigation’ and found themselves innocent of all charges, as usual, but to say it didn’t meet international standards would be a laughable understatement.) It’s hard to overstate how important this step was to the millions of Palestinians and their supporters who have been working for justice based on international law for decades. And what did the Palestinian Authority, led by Fatah’s Mahmoud Abbas, do? Under intense pressure from the US, Abbas caved and supported a six-month delay of the vote, effectively thwarting and delegitimizing it. How can any other country stand up to the US and support justice for Palestinians when the Palestinian Authority itself won’t? Six months is plenty of time for Israel and it’s international team of lawyers to bury the thing entirely and the rest of the world to forget about it. Why on earth would Abbas do this? Why would the Obama Administration demand it? Well, the Obama Administration needs a ‘peace process’ (and doesn’t need flak from the Israel lobby), and Netanyahu has threatened to withdraw from it if the Goldstone report gets a hearing. In order to keep good relations with the US, his European Union paymasters, and his Israeli prison wardens (who decide whether investments can come into the West Bank, many of which are incredibly lucrative for Abbas and his men), Abbas had no choice but to back down. In the eyes of Palestinians, Abbas threw away his ace in the hole in return for… nothing. Well, not exactly nothing. Israel had been threatening not to release the necessary frequencies to allow a second telecom company to open in the West Bank. There’s only one Palestinian cell phone company now, Jawwal, and its only competition is a handful of Israeli companies, such as Orange and Cellcom, which operate in the West Bank on behalf of the settlers but aren’t shy to take advantage of the captive Palestinian market. The new company, Qatari-owned Wataniya, could bring in investments worth $700 million, provide jobs for hundreds of Palestinians, and further enrich the upper echelons of the Palestinian Authority. Aside from a pittance of cellular bandwidth, what do the Palestinians expect in return for not ‘embarrassing’ Israel over the massive bloodshed in Gaza? Most expect nothing more than another charade of a ‘peace process’ in which settlements continue to expand, Palestinian leaders continue to bend over backwards, Israel continues to say it’s never enough, and two or three or ten years down the line, we’ll have more settlements, a more thoroughly entrapped and powerless Palestinian population, and no peace—like now, only worse. Some kind of violence will be inevitable, and a fair two-state solution will recede ever further on the horizon. That’s been the trend since at least 1993. And, particularly if the mobile phone contract story turns out to be true, some very decent scratch besides. Palestinian supporters of Abbas’ decision (and they are few and far between) say the vote has only been delayed until March, and knowing this sword of Damocles is hanging over their heads might make both Netanyahu and the Hamas leadership more cooperative in the meantime. But there are lots of problems with this. First, you have to assume Netanyahu cares what the rest of the world thinks, or that global attention to and support for the Goldstone Report will remain the same until March. Second, you assume Abbas might actually defy his masters at that time. So over in Gaza, Hamas captured a soldier and got prisoners released (and will likely get hundreds more released when they let Schalit go). In Ramallah, Abbas is groveling at the feet of Netanyahu and defying the will of his own people and the international human rights community in order to save a peace process that looks like it won’t go anywhere. If Abbas hadn’t already lost the Palestinian street to Hamas, he’s doing a great job of it now. On the other other hand… Another Haaretz commentator thinks Netanyahu actually lost this last round in a big way, and that Obama fooled not only him, but the usual talking heads (on both sides) as well. He says Obama pushed the settlement freeze knowing Netanyahu would refuse, and set up the alternative as “urgent and unconditional permanent-status negotiations with the Palestinians on all issues, with active American shepherding”—something Netanyahu came into office trying his best to avoid. But now he’s embracing it since it seems like a victory for him to begin negotiations without preconditions (i.e., without ceasing to expand settlements). The Goldstone Report would have just muddied those waters. Hopefully by the end of the year, with the global economy (at least appearing to be) back on the rails and the increasingly manic US health care debate under control, we’ll start to see which direction we’re heading in here in the Middle East. Maybe Abbas and Obama are subtle geniuses, and the rest of us need to catch up. Or maybe it’s the same old khara. We’ll find out fairly soon. Whatever the case, we all felt sick about Abbas’ latest humiliating capitulation and especially distraught to think about the people of Gaza, who have already suffered so much, getting slapped in the face yet again by not only the world’s indifference, but the seeming indifference of their own President. People weren’t thrilled with Abbas in the first place, and now they’re becoming dangerously restive. The kindest of the demands I’m hearing are for him to resign. A demonstration was organized in Ramallah on Monday at noon to march on Al Manara (Ramallah’s central traffic circle) and protest the move. I was a little nervous to go, because things aren’t like they used to be in 2005. Back then, you could march wherever you wanted and say whatever you wanted as long as you didn’t directly confront any Israeli soldiers, settlements, Walls, or army infrastructure. Well, that’s not really true—Israelis can invade whenever they want and arrest or beat or kill whomever they want. But you could say whatever you wanted amongst yourselves and protest in your own streets while the world ignored you, and the PA didn’t bother you. Now the West Bank policemen are starting to get trained by the US. This may sound like a good thing, even a generous thing, until you remember that the Egyptian and Jordanian police are also trained by the US. And these aren’t exactly democratic regimes they’re protecting and propping up, and they have questionable human rights records to say the very least. Palestinians are wary that their country, which before sort of managed itself within its cage given that the Palestinian Authority never really had much authority, is being slowly turned into another dictatorial police state. That was when it hit him. This wasn’t just one policeman playing Israeli soldier. This was getting serious. At best, it means a victory for the rule of law, which, as we all know, means very little without some mechanism to enforce it. But the question is: Whose rule of law? If the PA represents the will of the Palestinian people, fine. But more and more it seems not to be doing this at all. The Palestinian people tried to react in 2006 by electing Hamas—anyone but Fatah. But the world said, “Bad Palestinian people! Wrong vote! No democracy for you!” and still won’t talk with more than half of their elected representatives. Not to mention the fact that Abbas’ term as President ended more than a year ago, but elections have been postponed indefinitely since the schism between the West Bank and Gaza. So to further entrench an unrepresentative authority smells pretty rotten to the Palestinian people. Anyway, we marched on Al Manara, and the police stood on the sidelines and watched. Some people even waved to them. They are, after all, the friends and sons and brothers of the Palestinian people—just like all soldiers and all people, even the ones who commit human rights abuses. The demonstration walked around the block a few times and then congregated in Al Manara for a while. The Israelis ignored it. The international press ignored it. The police watched to make sure it didn’t get out of hand, and it didn’t. Gazans might get a momentary feeling of solidarity, but then it’s back to the smashed cinderblock grind. The first picture above is a homeless family taking shelter in ruins in Gaza. I took the second picture of two friends of mine, a cameraman and a photographer—both Palestinian—filming each other. It’s kind of a metaphor of what goes on at these non-violent demonstrations. The only people who see them are the ones who already know. Still, as useless as it was, it felt good to march with people who felt the same way about something important. And I ran into an old friend who has a new daughter, and I’m excited to visit him and his wife soon. And I went into Zeit ou Zaatar for lunch and had a fresh-baked musakhan sandwich and flirted with the cute waiters. So it wasn’t a totally terrible Monday. There’s more bad news, though. A friend of mine, Mohammad Othman from Jayyous, was recently arrested on his way back to the West Bank from Norway. Israeli security nabbed him at the Allenby Bridge border crossing. His crime? We have no idea. He’s being held in ‘administrative detention,’ which means he’s in prison without charge or trial. His stay has already been extended while they gather evidence against him. Um… aren’t you supposed to arrest people after you have evidence against them? Anyway, it’s probably going to be a bogus process where they’ll tell another prisoner or collaborator that he can get out of jail, get a permit to work in Israel, or be given permission to take their sick mother to a hospital if he points a finger at Mohammad. Naturally, to protect the collaborator, this evidence will be top secret. Mohammad and his lawyer won’t be allowed to see it. Who is Mohammad? One of the most active non-violent activists in the West Bank who works tirelessly to educate the world about the illegal theft and destruction of Palestinian life, land, and property by the Israeli army. For anyone who asks, “Where’s the Palestinian Gandhi?” (a back-handed way to blame the Palestinians for the entire situation, implicitly saying, “Israel wants peace but just doesn’t have a partner to make peace with”), well—here’s one. Among many. And how do the Israelis react? Mohammad is not the first, and he won’t be the last, non-violent activist to be arrested, beaten, seriously injured, or killed by Israel. For Palestinians, activism is not a careless weekend activity like it is in California. They risk their lives and the further deterioration of their freedom if they dare speak up. Mohammad was on his way home from an educational tour in Europe when he was arrested. Here’s more info. He’s a sweet guy with a great smile, a big heart, and brass… well, you get the idea. He doesn’t deserve this. He’s being held for days and days, interrogated repeatedly, and probably treated horribly. It makes my stomach hurt to think about it. People in the know predict he’ll be in jail for about six months and eventually released without charge. A little half-year vacation from educating the world about his people’s situation, courtesy of the Israeli army. I hope not. I hope he’s released soon. Last we heard, he was being held in solitary confinement in filthy conditions, and his health was deteriorating. I’m also taking her a trunk-load of baby clothes. I sent one email to the Ramallah email list asking if anyone had old baby clothes I could give to a friend in need, and within a week I had more than I knew what to do with. I could seriously start my own baby clothes store right now. In the likely event we don’t find Rania a job or adequate financial aid, I’ll need to gather at least enough money to get her through the winter and the first three months of her baby daughter’s life. I’ll let you know what this turns out to be—probably on the order of $1,000. My PayPal account is pamolson02@yahoo.com. Small donations of ten or twenty dollars add up very quickly. Thanks so much for all your help so far. It was just a random Biblical name as far as I was concerned. I didn’t know it was an Arab town in Israel, or what that meant. I also didn’t know that whether or not I got through this border would lead, among other things, to a new career, a star-crossed love, and the wrong end of a loaded gun. “What? He was what?” The guard’s eyes darted nervously, as if making sure he had back-up nearby. Christ. I’d sung about where Jesus was born every Sunday of my Bible Belt upbringing. But I’d just finished reading a Middle East guidebook, so all my associations were shifted, everything was a jumble in my head, a border guard with an assault rifle slung over his shoulder was breathing down my neck, and I couldn’t think. “Bethlehem!” I smiled and shrugged expansively, as if it were the most basic knowledge in the universe, trying desperately to look relaxed rather than relieved.